Chill out, guys. He probably just ran to Subway. Microsoft popped the cork on their press conference today by dropping a bunch of surly Spartans right into Halo 5: Guardians. Master Chief has finally gotten fed up with being the universe's most loyal soldier and bounced from his post, meaning this band of roided up space marines are trying to track him down. While the demo (complete with a ton of Covenant-crunching gameplay) focused on one squad of Spartans, Microsoft revealed the campaign will thrust you into the armored boots of two separate groups: those hunting Master Chief, and those lead by Chief himself. Touted as the "biggest, most ambitious Halo yet," Guardians doesn't mess around with scale. Every moment of the demo was punctuated with sprawling, massive levels in which everything was blowing up all the time. Halo vets might be familiar with the neon lit sci-fi levels, but apparently all that purple glow is highly explosive. Not to mention the ships that flooded the screen, or the baddies that have to watch where they sit for fear of squashing an entire alien trailer park. As far as co-op play is concerned, Halo enthusiasts with busy schedules can get their game on too. Microsoft noted this particular entry features "seamless drop-in, drop-out cooperative play." Just pop into the body of one of those AI Spartans running around blasting fools and team up to purge alien scum together. 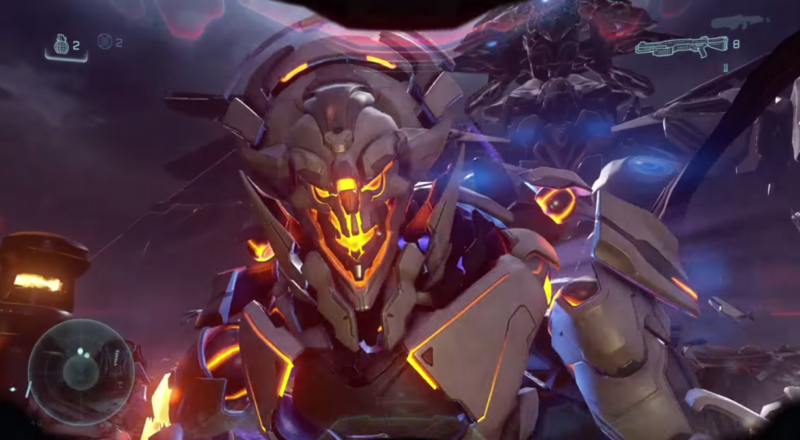 The newest twist on Halo's multiplayer is a new mode entitled Warzone. PvP isn't really our thing, but with Warzone, two sides of Spartans compete for control on a map dominated by NPC baddies. Sure, in the end it's still pvp, but with a nice co-op twist.